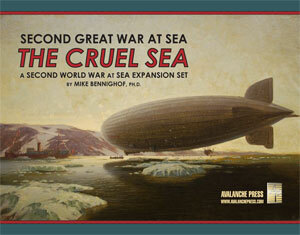 Second Great War at Sea: The Cruel Sea, our massive expansion set for Bismarck and Arctic Convoy, pits the 1940 High Seas Fleet of Imperial Germany against the navies of Imperial Russia and Republican France, with Britain at least initially standing aloof. Although less powerful than the High Seas Fleet, France’s Marine Nationale still commands considerable force. The French bring 25 battleships – the arbiter of sea power in the Second Great War – to the table, ten very modern fast battleships and 15 not-so-modern older ones. While the fast battleships matched the designs of other nations, or exceeded them, that wasn’t the case for the older ships. As we’ve seen, the first two classes of French dreadnoughts lagged behind those of other navies in terms of armament and design. For the third, French naval architects led by the brilliant young Paul Gille sketched what outwardly appeared to be a radically different sort of dreadnought. The new Normandie class had a dozen 13.4-inch guns, increased from 10 of them in the preceding Provence. These went into three quadruple turrets, each actually two separate armored gunhouses operating on the same barbette and turntable. That’s about where the radicalness ended. Normandie had the same hull as Bretagne (itself the same hull as Courbet), slightly enlarged with a torpedo bulkhead added but otherwise sharing many of the older ship’s flaws. On top of that, Normandie took a step backward with her propulsion, featuring a strange mixture of turbines driving a pair of inner propellers and vertical triple-expansion engines driving two outer propellers. Bretagne had been driven by turbines, as had the preceding Courbet class and France’s semi-dreadnought Danton class. Yet turbines consumed huge amounts of fuel, restricting a ship’s range. No other nation appears to have even considered solving that problem with a mix of turbines and VTE engines, though German designers tried to add a diesel “cruising engine” to increase the range of their dreadnoughts (a concept abandoned when the diesel contractor could not meet their delivery deadlines). More than likely this mixture would have provided a maintenance nightmare rather than speed or efficiency. Since the previous class had only included three ships, the Marine Nationale managed to score a budgetary victory and obtain funding for five units in the Normandie class, to even out the battle fleet’s divisions. Four were laid down in 1913, two at naval yards and two at private building firms, with a fifth laid down the next year – this ship, Béarn, had turbines only instead of the mixed propulsion system. Three ships were launched in 1914 and a fourth in 1915, all to clear the slipways for higher-priority work once war broke out, but none would be completed. Béarn eventually saw service as a very slow aircraft carrier. For their next class of battleships, Gille and the design team planned to retain the mixed power plant. The Lyon class design was an enlarged Normandie with a fourth quadruple turret for a total of sixteen 13.4-inch guns. Four ships were to be laid down, two in January 1915 and two more in April, on slipways vacated by Normandie-class ships. By then, workers had either been diverted to more pressing war work or drafted into the armed forces, and materials likewise diverted to other needs. The Lyon class would have provided the same maintenance headaches as Normandie with their odd mixed power plants. They did have enormous firepower, but preliminary plans called for no improvements in armor over the Normandie class other than an unspecified new scheme for underwater protection. Both classes would have carried an enormous number of 138mm (5.4-inch) secondary guns – two dozen of them – but many of these would have been placed in citadels directly under the 13.4-inch turrets, exposing the guns and crews to terrific blast effects. And both classes had six underwater torpedo tubes as well. In the Second Great War alternative history, construction resumed on the five Normandie class ships in mid-1917, as demobilized soldiers needed their jobs back and France already seethed with resentment over the emerging terms of Wilson’s Peace. With their slipways already cleared, the four Lyon class would be laid down at the same time. The Normandie class would probably complete in 1919 and 1920, and with the Lyon class commissioning in 1921 and 1922. All nine of them would be obsolete the moment they raised the tricolor, their batteries greatly out-ranged by the massive 420mm (16.5-inch) guns of the newest German battleships and battle cruisers, and not even a match for the 380mm (15-inch) guns of German ships built during the Great War. Most other naval powers had also already sent bigger guns to sea, and their ships had far better protection than the outdated armor schemes of the French dreadnoughts. Had Britain’s Royal Navy followed through on a December 1917 proposal to purchase the hulls and complete them in British yards, they likely would have been fitted with triple turrets for the reliable and effective British 15-inch Mark I naval rifle. That option wasn’t available to the French; the Model 1935 380mm gun wasn’t available until 1936 in our timeline, slightly earlier in the Second Great War history. And the revanchist government wished to show its commitment to building French naval power during, not after, the peace settlement negotiations. Modernization could do little to rectify the shortcomings of the two classes. The elevation of their main batteries had been increased during construction, adding to their range but not erasing their huge disadvantages. When they entered dockyard hands less than ten years after their initial completion, they would face enormously expensive internal reconstruction as their mixed power plants were replaced with oil-fired boilers powering turbines. Their internal subdivision, underwater protection and belt armor would be increased, while the useless armor over non-vital areas would be removed to reduce weight. All 24 of the secondary guns would be removed from their batteries and the casemates plated over. The layout of the huge turrets would make it difficult to place additional weapons on the main deck, so they would receive only eight dual-purpose 138mm guns in exchange, in four dual mounts, plus a fairly large array of light anti-aircraft weapons. They would carry a seaplane on the fantail, without a hangar, and would lose all of their torpedo tubes. In The Cruel Sea, they’re forced to tangle with the older German battleships on more than one occasion – bigger ships with thicker armor, far better internal protection and bigger guns. It’s not a pretty outcome for the French, but it’s a different story for their modern fast battleships.